School started for my daughter yesterday and today she is at home sick. She demanded my attention the whole time and I hardly got any time to cook. So made rasam and this thovaiyal to keep it simple. 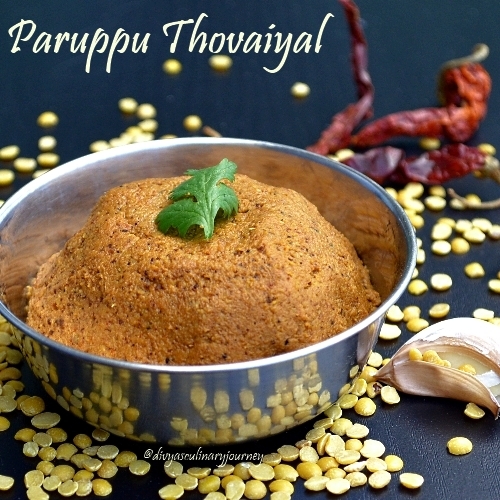 Paruppu thovaiyal is the kind of spicy lentil chutney served as an accompaniment with the rice. Add red chillies and garlic and fry them for a minute or two. Then add the toor dhal, a pinch of asafoetida and roast it in low heat till the dhal turns in color and nice aroma comes out of it. Then add the coconut, tamarind mix well and turn off the heat. Let it cool off, add salt to taste and required water and grind it into a coarse paste. Thovaiyal is ready to be served. 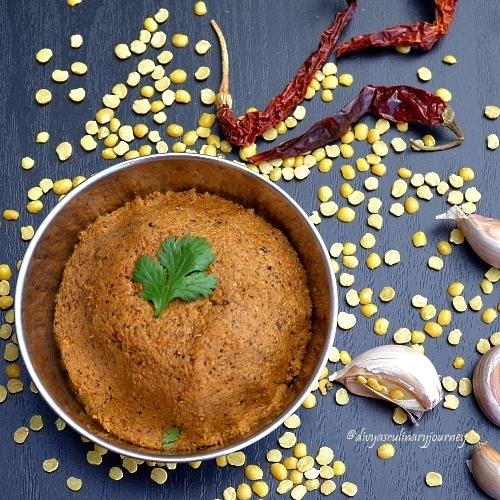 Serve with Rice and rasam or just this thovaiyal with dollop of ghee in the rice. Serves 3-4 persons. Perfectly made Divya. Looks yummm. Comfort food. Simple and healthy. Paruppu thovaiyal with rice porridge,my fav combo.I can survive for many days with it. Perfect combination. Rasam and thovaiyal. With roasted appalam. mm mm - this with some vethakozhamu and appalam = heavenly!!! Thovayal looks Fab Divya!!! Paruppu thuvayal, rasam and papad....don't disturb me...Very nice combo Divya, looks awesome!!! I would love to relish this with some boiled rice and a dollop of ghee! !super recipe!